Do you shop regularly on iTunes and Appstore? Have you ever thought of checking the entire history of your purchases on your iPhone or iPad? If yes, then you are in a right place. Here, we will provide you with the clear and complete steps to check your entire shopping history of the iTunes and Appstore from your iOS devices. 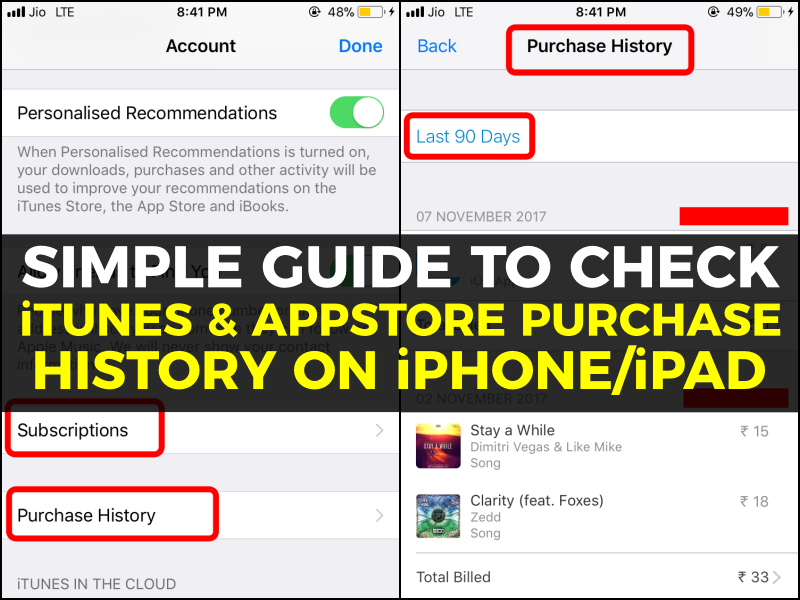 The purchases we make in the iTunes Store and in the App Store (music, videos, movies, apps, subscriptions, etc) are accumulated in a shopping history so that we can check them in our Apple ID account. So far that history could only be checked on a computer. Now, Apple has added a new feature in iOS 11 that allows us to access this history from the iPhone or iPad. To check the entire shopping history with all the payments made to Apple, one must follow the steps below. Go to the iTunes Store and App Store under settings. Then click on your ID> View Apple ID. In the lower part, you will find Purchase History as well as Subscriptions. Select the Purchase history to view all your purchases. Here you can see all the purchases made in the last 90 days, both free and paid includes music, apps, movies, etc. You can also select the data range and can view the purchase history of a particular year of any month. Select the year you want to see the purchase history. If you want to see all the purchases of that particular year, then click on the option All. If you want to see a purchase history for any particular month, then click on that month. I have selected the December month of 2016. There it shows the entire purchase history done in that month. If you want to see the details of any particular order, then click on that particular order and there you can see the complete details like Order Id, Date of purchase, Billed to, Document number, purchase amount, and payment method. If you see the details of a particular purchase it shows us which payment method that has been used, as well as options to indicate a problem or the number of the document. This is ideal to check what payments Apple has charged us in each moment and to keep track of it. All purchases are grouped by the date they were charged in the corresponding payment method. If you have not yet been charged for a purchase, it may appear with the Pending label. By default, only purchases from the last 90 days are shown, but this can be changed. What happens to the shared accounts as a family? You can see the purchases of the rest of the family members, even if you know the ID and password to access. This is how we check our iTunes and Appstore purchase history on our iPhone or iPad devices. If you are facing any issues while following the above method, let us know them in the below comment section. We will get back to you as soon as possible to solve all your queries. Which payment method do you use most to do purchase on iTunes and Appstore?